I’ve been following the impact of pollution on sea life with great interest and more than a little sadness. Doug Abrams, author of Eye of the Whale, has done such a great job outlining the issues, that I wanted to share his words with you here today. —————————What does garbage in whales have to do with our children’s health? A gray whale that washed up in Seattle had garbage in it’s stomach ranging from sweat pants to plastic bags to surgical gloves to a golf ball. Is this just a bizarre symptom of a dirty planet? It is bizarre but unfortunately not uncommon and it actually speaks to a much more serious problem in our oceans and in all life including our children. For whales, pollution is the new harpoon that is increasingly killing whales as well as other ocean-dependent life. Many seabirds are literally starving because there stomachs are so full of plastic. But it’s not really the sweat pants, the plastic bags, and golf balls showing up in stomachs that is the greatest danger. It is really what they represent: a world awash with “persistent organic pollutants.” In short, it’s not the big stuff, it’s the little stuff, the microscopic stuff. Beluga whales in the remote Hudson Bay are so filled with industrial chemicals, including plasticizers, that they must be treated like toxic waste when their dead bodies wash up on shore. The Canadian government requires a special permit to transport their bodies across provincial lines. 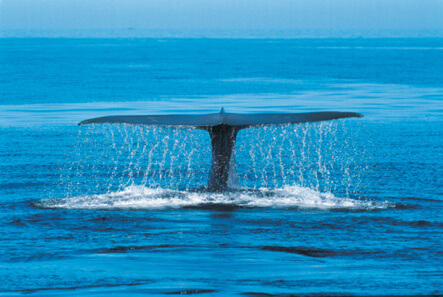 But these problems are not just affecting whales and other marine life. They are also affecting our children. A recent study of newborn babies’ cord blood discovered an average of 200 industrial chemicals in their bodies (Dr. Greene was the pediatrician on this EWG study). This is before the first breath or the first sip or their first bite of food. Our children, in short, are being born pre-polluted. Pollution is the new harpoon, but this harpoon does not just threaten whales. Douglas Carlton Abrams is the bestselling author of Eye of the Whale, an eco-thriller about the health of our children and of the planet. For more information about endocrine disruption, the research mentioned in Doug’s blog posts, and about Doug’s novel, please visit DouglasCarltonAbrams.com.